The trenchless contractor, headquartered in Ireland with a Canadian office in Mississauga, tackled a complex project in Toronto last summer involving the reconstruction of the West Don Trunk Sanitary Trunk Sewer. The job involved the diversion of decades-old sewer lines built under the G. Ross Lord Dam and Reservoir. When they were done, the curved tunnel had become the tightest-radius microtunnel ever installed in North America, according to Ward & Burke. 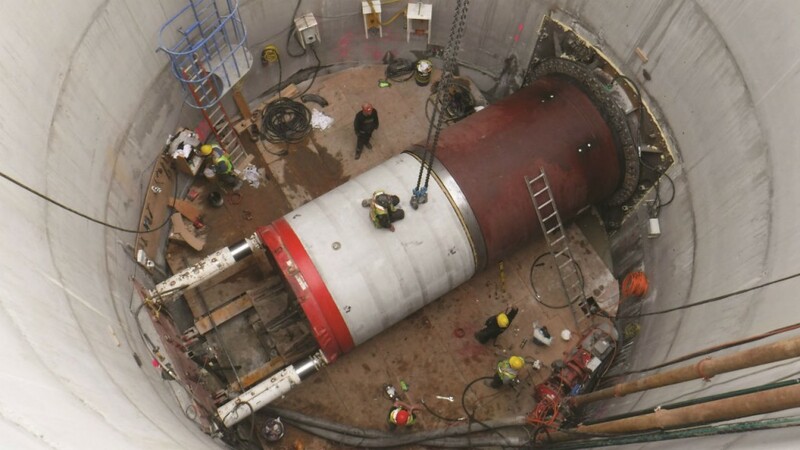 A few weeks later, the company deployed equipment in Western Canada to install 420 metres of 2,400-mm ID storm trunk sewer in Calgary (the project also comprised a 985-m open cut section) for another North American first: the largest internal-diameter microtunnel installation. The City of Calgary needed to relocate an existing trunk sewer when it was preparing to construct the southwest portion of the Calgary Ring Road. Whisell Contracting was awarded the contract for the project in July 2015, and Ward & Burke was selected as the subcontractor for the tunnelling portion as well as the construction of a 10.4-m ID x 15-m deep launch shaft. The method of digging small-diameter tunnels has been used extensively in the Toronto area, where Ward & Burke established an office in 2011, but has been less prevalent in Western Canada. For the Calgary Ring Road project, the size of the tunnel, 2,400-mm, meant that microtunnelling would be competing with bids involving a TBM. But microtunnelling in this case was more efficient, albeit a little more expensive, explained Ward & Burke director John Grennan. Ward & Burke started shaft construction at the end of August, first building a reinforced concrete caisson as the launch shaft. A Herrenknecht AVN 2500 microtunnel boring machine (MTBM) and separation plant equipment by ITE Gmbh were mobilised from Toronto for the tunnel installation. “The tunnel basically started in the local shale mudstones of Calgary, under about a 10-metre water head, and then after about a 320-metre mark, the tunnel transitioned from shale into glacial till where you had glacial sand, cobbles, and boulders, and with the groundwater above you,” he said. The machine averaged about 15 metres a day and achieved maximum productivity one day of 48 m. Microtunnel installation took exactly one month, from October 26 to November 25. The jacking pipe, 2,500-mm reinforced concrete pipe (RCP), was manufactured by Monro Ltd. and trucked across Canada from their plant in Ontario. The huge logistical task was seen worthwhile given the microtunnelling system’s dependence on quality pipe product, according to Grennan. The pipe sections, each weighing about 20 tonnes, were continuously hauled to the site and stockpiled as the tunnel was being constructed. To replace a sanitary trunk sewer that was built underneath the G. Ross Lord Dam and Reservoir, the City of Toronto awarded a $12.3 million contract to Ward & Burke in April 2015. Built in the 1950s, the sewer was showing signs of “distress”, with sewage leaking into the reservoir during high flows and water from the reservoir infiltrating into the pipes, causing extra treatment and costs for the city. The project involved construction of 787-m and 900-mm ID microtunnels including four deep tie-in shafts to relieve the existing sewers under the dam and reservoir. Ward & Burke started by building access roads through parkland to the shaft location. Concrete caissons were then sunk to a depth of 20 metres through the glacial till, with most tunnelling taking place below 10m of water pressure. “That particular tunnel and alignment was driven out of the fact that they didn’t want the tunnels going near or under the existing foundation of the dam. They wanted to bring the sewer around the perimeter of the dam. First they looked at two straight tunnels rather than a tunnel with such a severe curve in it. But there was no intermediate shaft location possible due to oil and gas pipelines laid in the vicinity of the dam and also overhead hydro lines. So they came up with the design and alignment with the tight radius curve microtunnel on it,” Grennan explained. A key component of the job was the construction of the curved microtunnel around the existing dam wall. Due to restrictions with oil and gas pipeline utility corridors and overhead powerlines, a curved microtunnel with a radius of 250m was required over a length of 350m. Jackcontrol AG was awarded the subcontract to produce the hydraulic packer system from between each jacking pipe; Munro produced the pipes for the project. It was the first project in Canada tackled by Switzerland-based Jackcontrol. The firm’s hydraulic packer system distributes the jacking load evenly over the wall of the pipe as it goes around the curve, Grennan said. Concrete jacking pipe was hauled across Canada in 20-tonne sections for the 37th Street SW job. A key component of the West Don Sanitary Trunk Sewer project was the construction of a curved microtunnel around the existing dam wall.